Cameron Maybin was the beneficiary of a major umpiring snafu last night when he was awarded a walk on what should have been ball three in his at bat in the fifth. Usually a mistake like that would be as big of a deal, except, Maybin can around to score the only run of the game in a 1-0 Padres win over Seattle. Maybin didn’t directly reference the incident on his twitter (@cammaybin) but did have one tweet following the game. “What a weird night but a wins a win,” he tweeted. Reaction from the Mariners has been minimal. Shawn Kelley (@shawnkelley23), a pitcher for the Mariners who is currently on the DL made a reference to it whole showing support for starting pitcher Doug Fister. “Chalk up another tough loss for doug!! #3ballWalks,” Kelley tweeted. 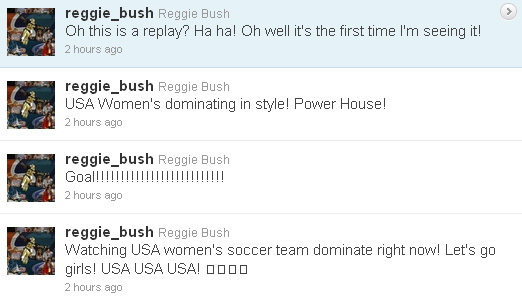 Reggie Bush is getting into women’s soccer. In their match against Columbia today, the US women looked strong and Bush was getting pretty fired up about it. The only problem is he was watching the game replay on ESPN Saturday night, nearly eight hours after the match had been played in Germany. Bush presumably jumped into the match while it was already underway. “Watching USA women's soccer team dominate right now! Let's go girls! USA USA USA!” Bush tweeted. Moments later the US scored one of three goals in the match and Bush let all of his followers know what had actually happened much earlier in the day. The best part is, many of his followers didn’t know the game was played this morning either, with some tweeting him back asking for the score. Finally after tweeting, “USA Women's dominating in style! Power House!” some people started letting him know the game was a replay. That was his last tweet of the night. Hey Reggie, Super Bowl XXXI is about to start on the NFL Network. My money is on Green Bay. Wanna take me up on it? I am going to try something new and see if anything really comes from it. I am going to cover the world of sports using one twitter as a source. Tweets will be leads and in most cases the direct quotes for stories. It seems like that is all you have to do these days is keep up with an athlete or coach on twitter to be able to write about them. So that is what I am going to do. You can follow the twitter feed at @tweetbeat21 where I’ll try to retweet some of the best tweet and post links to updated blog entries. I may even try to recruit some other writers to help keep up with everything in the world of sports according to twitter. If you are following someone that is a great source on twitter, drop a comment on the blog or tweet me.